Pistachios are largely neglected in the baking world, at least that’s how it seems to me. When I bake with nuts, I tend to grab the pecans or almonds or hazelnuts. But, pistachios are so good that it’s really a shame I don’t bake with them more. 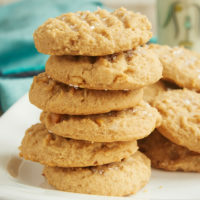 These cookies remedy that at least a little bit. I started with a basic vanilla cookie and added roasted pistachios. The cookies are good all on their own. I kept them on the not-too-sweet side because I knew I wanted to frost them. That frosting is a lovely cream cheese frosting flavored with white chocolate. Now, a couple of things about the frosting. First of all, I wanted it to be nice and sturdy on top of the cookies, so it’s nice and thick. The second thing about the frosting is to remind you that white chocolate can be challenging. Whether you use the microwave or a double boiler to melt it, just remember to go slowly. It can very quickly go from almost melted to ruined. Slow and steady, folks. And, don’t forget to stir. This frosted cookie is somehow greater than the sum of its parts. The cookies are good, and so is the frosting. But, put them together and they’re really a special pairing. As you can see, I topped these cookies with some green sanding sugar. I do love sanding sugar, but I’m pretty sure I’ve never used a colored sugar to sprinkle on top of a dessert. 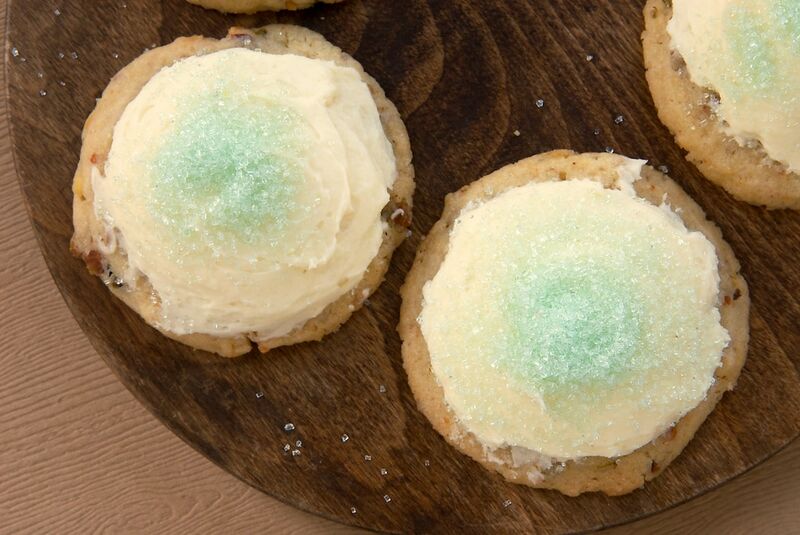 The reason for that splash of green is to help celebrate the new cookbook Sprinkles! by Jackie Alpers. It’s full of desserts that use all kinds of sprinkles in delicious ways. 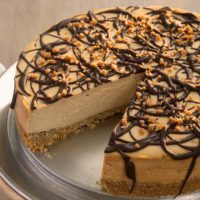 What a great way to add some fun to dessert! 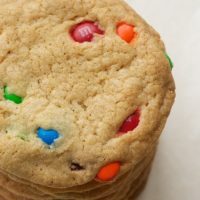 Quirk Books, the publisher of the book, is having a little Sprinkles tour around some food blogs. We each picked a color for our tour stop and got out the sprinkles for some baking fun. We Are Not Martha kicked things off with red. Then, Baked Bree went with orange, and Kitchen Konfidence had some fun with yellow. Stay tuned in the next couple of weeks for more sprinkles fun with Kitchen Meets Girl and Cherry Tea Cakes. Now, you can join in the fun, too. 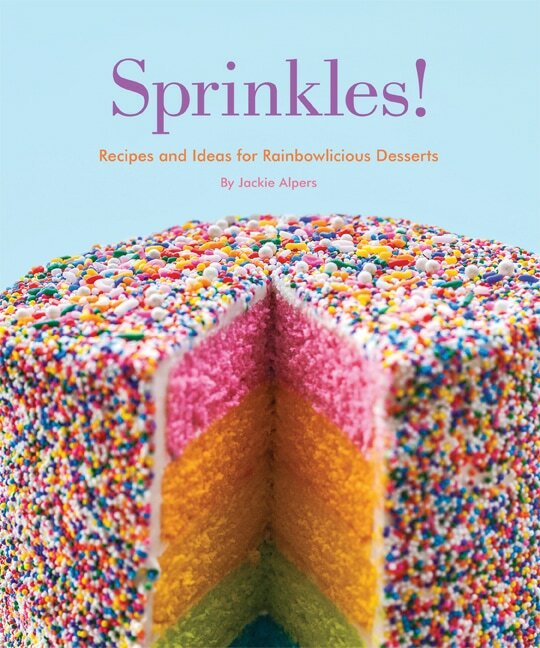 Quirk Books is giving three Bake or Break readers their very own copy of Sprinkles! Scroll past the recipe for details on how you can win. Using an electric mixer on medium speed, beat butter and sugar until light and fluffy. Add egg and vanilla, mixing until combined. Reduce mixer speed to low and add the flour mixture in three or four portions. Mix just until combined. Drop dough by tablespoonfuls onto prepared pans. Flatten each cookie slightly. Bake 12 to 15 minutes, or until cookies are lightly browned. Place pans on wire racks to cool for 10 minutes. Then, transfer cookies to wire racks to cool completely. Place white chocolate in a microwave-safe bowl. Heat in microwave at half-power in 30-second increments, stirring every 30 seconds. Repeat until chocolate melts when stirred. Set aside to cool slightly. Spread frosting onto cooled cookies. If necessary, chill the frosting for about 10 minutes to make it firm enough to spread. 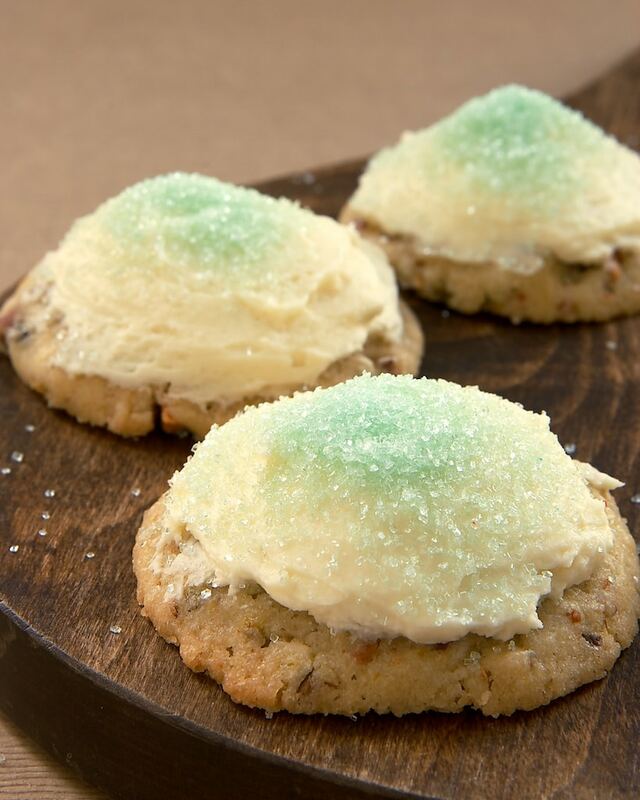 Sprinkle the top of each frosted cookie with sanding sugar. *I made the frosting on the sturdy side so that it would hold up well on the cookies. 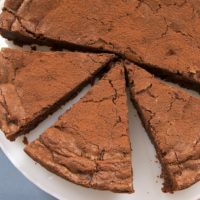 If you want a thinner frosting, mix in a teaspoon of milk at a time until the frosting reaches the desired consistency. Cookies recipe adapted from Almond-Apricot Sandwich Cookies. Please see all the details and requirements for entering the raffle in the widget below. If you are unable to see the widget, be sure your browser is updated or try using a different browser. Please note that the winners must be U.S. residents 18 years or older. Be sure to add bakeorbreak at gmail dot com to your address book so that a winning email from me doesn’t end up in your spam folder. If a winner doesn’t respond within 48 hours, another winner will be chosen. Disclosure: I was provided with a copy of the book and the opportunity to host the giveaway. All opinions are my own. What a gorgeous cookie! Love! 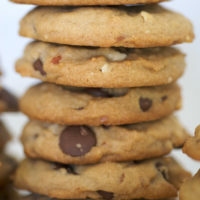 I’m pretending you made these cookies WHITE CHOCOLATE FROSTING with me in mind! Just agree….you don’t have to say nooooo! These are right up my alley! Already pinned! I love frosted cookies! And pistachios are one of my favorite nuts! What a unique combination of flavors! 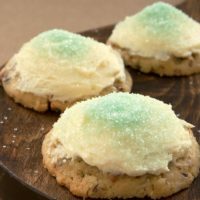 The pistachios give a wonderful creamy flavor to the cookie and I love love love the cream cheese frosting. Thanks for sharing! I am in total agreement – pistachios don’t get enough love!! 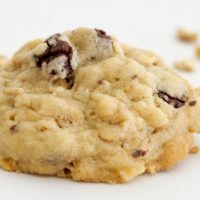 They sound so perfect in these cookies paired with the white chocolate frosting! I tend to neglect pistachios in my baking, too. I’m looking forward to trying this recipe. And the white chocolate cream cheese frosting looks incredible!